The Med-Aire Plus pressure and low air loss mattress system is the elite among all of our twin mattress systems. 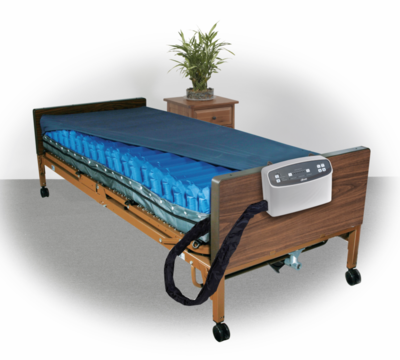 The Med air plus mattress offers an accurate and adjustable pressure monitoring system that includes an advanced pump with a built in microprocessor that monitors and maintains consistent pressure disbursement while stimulating blood flow and circulation. Each alternating cell inflates and deflates over a predetermined cycle time that protects the patient from pressure ulcers while healing existing bedsores. Our air med plus system has a patented cell in cell configuration that provides additional support while preventing the patient from bottoming out. This alternating pressure mattress remains inflated for up to 24 hours in the event of a power outage. The mattress also has an additional 2� cell that remains inflated along the base of the mattress at all times to offer additional protection while the mattress is in an elevated position. This mattress is approved by Medicare and is guaranteed to heal and protect the patient from existing and future bedsores, pressure wounds, and decubitus ulcers. Cell-on-cell design of 8" deep air cells prevents �bottoming out� and also provides up to 24 hours of power outage protection. Digital pump allows for customization to individual patients� comfort and safety needs, and will auto return to alternating pressure mode if system is left on static mode for >2 hours. Each one of the 20, 8" deep air bladders are easily removed and replaced. Pillow function maintains the 3 air cells at the head of the bed in static mode for patient comfort.